Over the years, our family has opened over 30 restaurants in Western Washington. Many of the restaurants have since been sold out of the family with our parent's retiring. 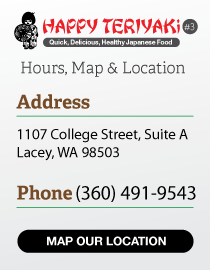 Our restaurants, Happy Teriyaki #3 (Lacey) and Happy Teriyaki #5 (Tumwater) are one of the last places to remain in our family. In recent years, there has been much confusion as it seems many new local teriyaki restaurants are giving themselves suspiciously similar names! Although it is flattering that they'd like to give the impression of an association to our restaurant, our customers always know the difference. There is no mistaking the superior taste of our secret homemade teriyaki sauce. After all, it's been a secret for over 32 years!